Since the Company's inception in 1978, DSC has specialized in the development of unix programming development tools, call center and unix applications, computer telephony integration software, and PC based phone systems. These products have been developed to run on a wide variety of computer systems and have been tested and operational on Unix servers and systems. The following products are specially suited to operate in a Unix environment, particularly for SUN Solaris, IBM AIX, and HP-UX operating systems. Database Systems Corp. has prepared full length presentations of its Unix applications and products that you can easily download and view. Included are several different demonstrations of Unix development tools, CRM campaigns, and a presentation on our call center phone system (PACER) that works in conjunction with Unix application servers. This presentation describes PACER's robust features plus a tutorial on predictive dialing. Also included is a presentation on remote agents and web capabilities. Simply click on the graphic image to your left to download and view our Unix product demonstration. Window On the Web (WOW) is a thin client software development toolkit designed for application developers who want to write programs on a Unix server that operate on Windows PCs. Features include complete graphical user interface (GUI) including enhanced graphic and multi-media support. These PCs can be connected to the Unix server via a Local Area Network (LAN) or through the Internet. The Unix Windows product includes a complete application development toolkit that runs on a Unix server as well as a thin client component that resides on each Windows PC. Applications can change rapidly, but the thin client is a static component that does not need to be updated when your Unix systems program changes. Graphics and multi-media can be cached locally for fast execution. For a complete product presentation, download our WOW demo. Telemation is a Unix CRM Software application employed in a wide variety of applications including contact management, help desk, customer service, fund raising, and catalog sales to name only a few. The package also fits both B2B and B2C requirements and has extensive Unix CTI software features. TELEMATION operates on a Unix crm server (as well as LINUX and WINDOWS) and communicates with our PC based phone system via a LAN. Unix software programmers enjoy the freedom to develop and modify call center and unix applications using the Telemation toolkit because of robost development features inherent within this application. 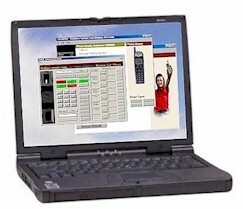 Telemation also links to service agents running our thin client on their desktop PCs. For a complete product presentation, download our TELEMATION demo and view our demos of Telemation running on Unix systems. The PACER phone system is a state-of-the-art telecom server that handles inbound and outbound phone calls for small to large call centers running on Unix systems. Calls are either initiated by the phone system or accepted from the outside and distributed in an intelligent fashion to your service agents. The PACER includes ACD and IVR components, plus Call Recording capability. Using industry standard components, the PACER phone system has features and functions that can only be found in large scale PBX�s, but at a fraction of the cost. And the PACER has predictive dialer capability that cannot be found in most of these larger phone systems. The PACER phone system can connect calls to your employees who are working at home or in remote offices. The PACER is a WINDOWS PC that communicates with applications written on Unix crm software servers over a LAN using our unix programming tools. With our Unix telephony software, programmers can enhance their Unix cti software by adding telephony and softphone features. Unix IVR scripts can be developed as well using unix programming languages. For a complete product presentation, download our PACER demo. Visit our Products web page for other Unix programming products and Unix software.